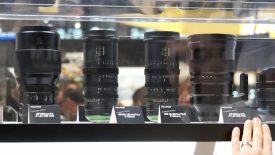 Cameta Camera asked Fujifilm about the availability of the Fujinon GF 250mm f/4 R LM OIS WR, XF 200mm f/2 R LM OIS WR, and XF 8-16mm f/2.8 R LM WR, which will be launched in spring and summer 2018. Not a lot of new information, but the video gives us our first good look at how these lenses compare size wise and the Fujinon XF 200mm f/2 looks to be a little shorter, but fatter, than the Fujinon GF 250mm f/4. Both lenses should focus quickly since they are LM lenses, but it’s unclear if the GFX will be able to track in any useful way. The XF 200mm f/2 will be amazing with the XF2X TC WR and XF1.4x TC WR teleconverters, which will turn the lens into roughly a 400mm f/4 and 300mm f/2.8. The GF1.4X TC WC teleconverter is also shown in the video, but I didn’t take a screen capture. The GF1.4X TC will turn the Fujinon GF 250mm f/4 into roughly a 350mm f/5.6. The Fujinon XF 8-16mm f/2.8 R LM WR is also pictured and looks quite large so if you value portability the Fujinon XF 10-24mm f/4 R OIS might be a better lens for you. I am sure the XF8-16mm will be an amazing lens, but the XF10-24mm is already around $1,000 even on sale so the XF8-16mm will also be substantially more. You will have to really love fast wide angle lenses to justify the expense and size/weight of the XF8-16mm when it is released. Join our Fujifilm GFX Owners Group which is growing rapidly, or our new Fujifilm XE Owners Group, also follow the Fujifilm GFX Page to get more tailored news on Facebook and follow Fujiaddict on Facebook and Twitter. 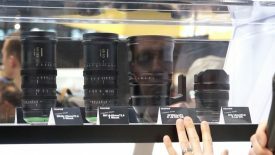 This entry was posted in Fuji lenses, Fujifilm GFX, Fujifilm GFX 50S, Fujifilm X-E3 and tagged Fuji 250mm, Fuji GFX, Fuji GFX 50S, Fuji GFX50S, Fuji Rumors, Fujifilm, Fujifilm 250mm, Fujifilm GFX50S, Fujifilm Rumors, FujifilmRumors, Fujinon GF 250mm F4 R LM OIS WR, Fujinon XF 200mm F2 R LM OIS WR, Fujinon XF 8-16mm F2.8 R LM WR, Fujirumors, GFX, GFX 50S, GFX50S, Medium Format, Super Full Frame. Bookmark the permalink. Trackbacks are closed, but you can post a comment.